North of San Francisco, the Pacific coastline becomes gradually less developed, wilder and less visited, and long stretches of beaches and cliffs have no particular designation or protection. The first 70 miles, though, from Point Reyes northwards are quite well regulated, the land contained within various state parks and reserves, of which the most well known is Sonoma Coast State Park, covering 15 miles of the coast between Jenner and Bodega Bay (see map). The majority of the shoreline here is characterized by long beaches of coarse, greyish sand beneath high cliffs, interrupted at intervals by rocky peninsulas and guarded by many tiny islands out to sea - quite spectacular on a large scale but perhaps less interesting and photogenic close up than parts of the coast further north in Mendocino County and north Sonoma County (such as Point Arena, Salt Point or MacKerricher State Park), which have better rock formations, and receive fewer visitors. As with most of the California coastline, Highway 1 runs next to the ocean, right through the state park, which is 70 miles north of San Francisco and 25 miles west of Santa Rosa. Short side roads lead to beaches and cliff top parking areas, mostly free to enter though fees are charged at some of the most popular locations. The park has several trails along the cliffs or across the inland prairie, while hiking beside the ocean is also possible, on some of the longer beaches. There are four campgrounds - two small, primitive areas away from the sea (Willow Creek, Pomo Canyon), and two developed sites overlooking the water (Wrights Beach, Bodega Dunes). slowing traffic to 15 mph in some places. A spur road leads to Vista Point, an overlook right on the cliff edge, reached by a one mile loop trail. 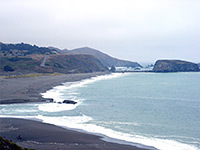 The highway then descends to Jenner, on the north bank of the Russian River, which is crossed a little way inland after which the road returns to the coast. The river joins the ocean just north of a big stretch of sands lined with much driftwood along the high water mark, extending southwards to Goat Rock, a vertical-sided hill surrounded on three sides by the sea. This beach is supposedly one of the most dangerous in California owing to the high surf, steeply-sloping sands and presence of sneaker (or sleeper) waves - occasional, unpredictable waves of much greater power than average. None of the Sonoma Coast is suitable for swimming, such is the force of the swell and the rip currents. Another long uniform beach (Blind Beach) stretches nearly a mile further south, until the next promontory. The Goat Rock area is one of the busiest in the park, reached by a side road that descends right down to the causeway connecting the rock to the beach, also passing trailheads, picnic areas and a couple of private buildings. A group of harbor seals live on the beach, hence dogs are forbidden. The next access south is at Shell Beach, a rather small, partly stony cove that doesn't seem to have any seashells, but is a good spot for viewing tidepools. The coastal Kortum Trail, which starts at Goat Rock Beach, runs past here southwards to the next major location at Wrights Beach (6.5 miles in total), one of the few locations where a fee is charged for entry, though limited free parking is available along the very short approach road. Wrights Beach also has a nice, tree-lined campground - some of the 27 sites look out directly towards the Pacific. The surface is a mixture of sand and shingle, beneath 80 foot cliffs with houses built on the edge, part of the small community of Ocean View. The sands end at a rocky area of cliffs, terraces, tidepools and a small island (Hogback), all inviting exploration though guarded by a 'Dangerous Rocks' notice; in general all the state park is quite highly regulated, and any possible hazard is marked by a warning sign. 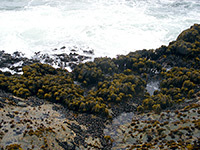 The rocks (Duncans Point) can be seen in safety from above by a short loop road, that also overlooks the next section of the coast to the south, where the cliffs are even lower, allowing CA 1 to stay very close to the edge. For 3 miles the highway passes small sandy coves, shoreline access points and scattered houses as far as Bodega Head, at the south edge of the park. Here, a sandy promontory extends southwards for several more miles, crossed by various trails, and ending at a high, rocky headland. Like Point Reyes, this land lies on the west side of the San Andreas Fault, which runs across the sand dunes into Bodega Harbor to the south. 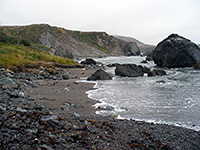 Part of the promontory is privately owned, including University of California Marine laboratory, Bodega Harbor and residences from Bodega Bay. The peninsula also has the longest sands in the park - 2 mile South Salmon Creek Beach, another place where dogs are not allowed. Nearby towns with hotels include Santa Rosa (25 miles), Sebastopol (15 miles) and Windsor (28 miles).